Towards the end of the summer of 2005, following extensive negotiatons for the purchase of Bologna F.C. the debate regarding the construction of a new football stadium in Bologna commensurate with UEFA rules became extremely active. In this context of economic, social and cultural growth for the city and for the bolognesi, a project for a real "Sport City" was undertaken in the form of an entrepreneurial initiative destined for sport, free time activities as well as show sports in their various disciplines. 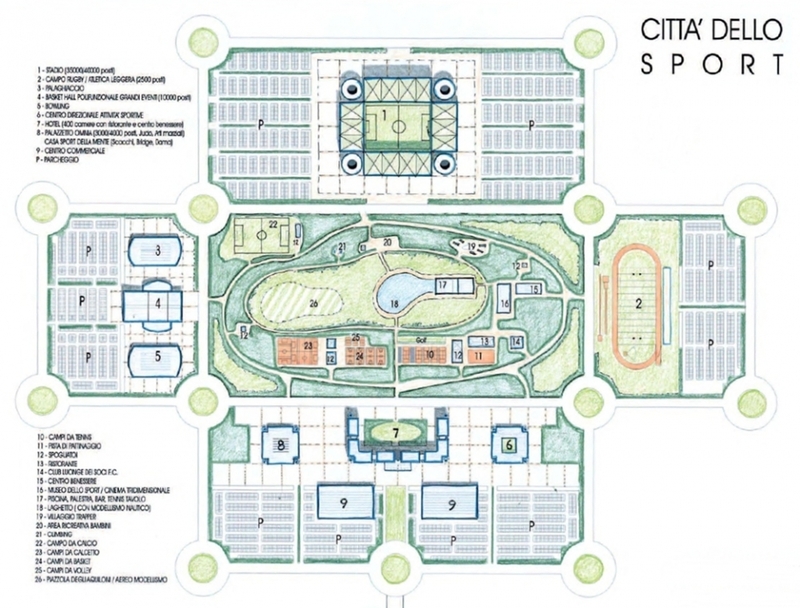 The design concept envisaged the location of the 170 acre complex in the immediate vicinity of Bologna, close to the principal comunication routes and easily reachable by existing and future public transport networks. Designed with rationality of use and management of the complex in mind, particular attention has been given to the introduction of innovative tecnologies for renewable energy with zero emmissions. 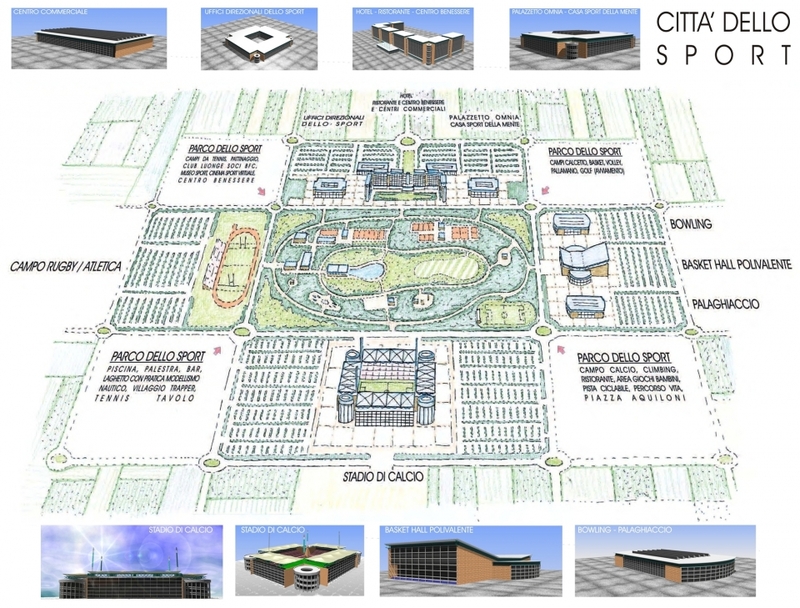 The project envisages a real estate investment aimed principally at sport, exploiting possible synergies with Bologna University and with the Trade Fair, in view of the enlargement of both the "Marconi" airport and the central railway station. A development of a cultural/sportive turism for Bologna would be further enhanced by the reduction of travel times considering the high speed rail link connecting Bologna to such art centres such as Florence and Venice. 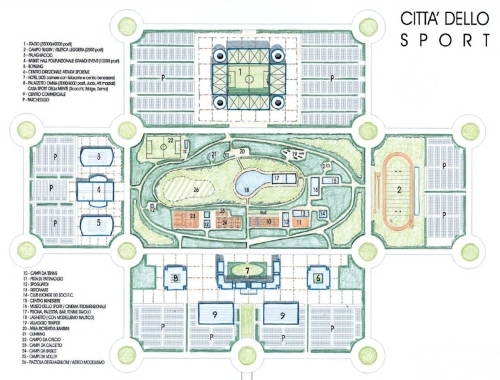 -the central nucleus consists of a sports park which would occupy an area of 45 acres destined for amateur sports, to health and leisure. The park is equiped with recreative areas for children, cycle paths, exercise circuits, wellness centre, swimming pool, courts for tennis, basketball, volleyball, and a football field, rollerskating, iceskating, trapper village, areas for arial and nautical modellism, restaurants, sport museum and trisensorial cinema. The perimeter zones of the park are destined for the construction of arenas and structures for multi discipline show sports. -the southern sector is the main park entrance and would contain a hotel complex offering different types of accomodation, short and long stay, for a maximum of 800 beds; commercial areas selling sports products and personal goods for approx. 7000sq; an office building for sports management, for professional and amateur groups, for agencies, for federations and for meeting rooms of approx. 3000sq.m; an OMNIA building and "home of sport of the mind" dedicated to all gymnastic disciplines, dance, fencing, table-tennis, Chess, Bridge, of 4000sq.m. Parking for 1250 cars. -in the eastern sector is envisaged a Rugby stadium with 8 athletic tracks with necessary ancillary spaces; the stands will be covered for 2500 people. Parking for 1250 cars. -in the western sector three buildings are envisaged. Centrally placed a multipurpose building for basketball, volleyball and other sporting manifestations with a capacity of 10000/12000 people. The structure of the asymmetric stands can be transformed into a concert/conference hall for 8000 people by means of the movement of a semi fixed stage. The building is equiped with aerial racks for scenery and illumination and for optimization of acoustics for musical and theatrical events. On each side of the multi-purpose building are envisaged two buildings, one for ice hockey and ice skating and the other for Bowling. Each building has a capacity for 2500 people an parking for 1250 cars. -in the northern sector a football stadium is envisaged with a capacity for 35000/40000 people with completely covered stands and includes bar, sport lounges and dedicated services. 4000 car parking spaces are provided for this area.